Google Allo vs WhatsApp vs Facebook Messenger vs Snapchat: the competition gets tougher and tougher. Have a look and find out which one is better. Read on. Google Allo vs WhatsApp is the talk of the town these days. Google Allo joins the flock of the other instant messaging and communication apps with a bang. WhatsApp, Snapchat, Hike, Facebook Messenger, Line, Google Hangout, etc. the list goes on and on. But not all of the instant messaging apps have changed our lives, right? It’s only a few of these apps that have actually made a mark on the private space of our smartphones. If I had to jot down a few names I would definitely think it to be WhatsApp and Facebook Messenger that have commanded us throughout. To just put it in terms of statistics, both of the apps have 1 billion users each. Finally, the much awaited Google Allo comes along to blend itself with the others and make a mark of its own. After the launch of Duo, the video calling app that got an update to v 2.0 and Allo, both initiatives by “the Google” are something to look forward to. India is the land where all the communication apps get tried and tested and for all the good reasons this market definitely grows bigger and bigger. Google Allo has some of the most interesting, fun and new features which might actually take control or rather is a tough competitor in the coming days. It is based on a simple method of login via mobile number rather than e-mail. It might work wonders for the App users. Let’s check out the pros and cons of what Google Allo is all about and how will it stand out from the other messaging apps. Also, we shall consider the other most used apps and study the differences. Google Allo can do a lot more than what you can really think of. The App is powered by ‘Google Assistant’ which acts as a search engine within the App and will have answers for every question that you might ask. Apart from answering your queries, it might just help you out in giving suggestions regarding movies and its timings, food joints nearby or you might just end up playing games. The App also has this feature of ‘smart replies’ where it gives auto-suggestions based on your usual responses. The ‘Incognito Chat Mode’ provides with an end-to-end encryption and after a while, the chat disappears on its own. The expiration duration for each chat message can be modified in this mode. It offers a wide range of emojis and stickers created by independent artists and you can also draw on photos and videos (applicable only in Android version). GIF’s can be sent on Allo like the Gboard on the iOS. Allo also supports ‘Group Chats’. The user also has the option to send normal messages i.e. SMS to anyone in his/her contact list who do not have the Allo app. The response to such texts via normal messages can be seen in the App itself. The other interesting feature introduced is the use of ‘Hinglish’ as a language apart from English. It has been created keeping in mind a large number of Indian users. From the privacy point of view, the app is not that safe because Google accumulates all the chats with Google Assistance. File-sharing feature is not available in the App which is one of the biggest setbacks as many other instant messaging apps provide this feature. Another major drawback is that you can only use it in one device at a time. This means changing to another smartphone would actually lead you to start from scratch losing all your chats, pictures and videos. In today’s time, the biggest strength of the WhatsApp messenger is the feature of end-to-end encryption which actually denies access to any third party to go through your chats. Deleting the chat means it is gone forever. Voice- calling feature is also available. It has the feature to support sharing from the other apps such as OneDrive, Google Drive, etc. files can be uploaded in the chats from these apps. WhatsApp is, however, thinking to raise their features by adding stickers as one of the elements and also provide with the option of scribbling on pictures. WhatsApp also has this feature integrated in the iOS version of smartphones named Siri. It is a voice- assistant, has an answer to everything, can send messages and also make voice calls. 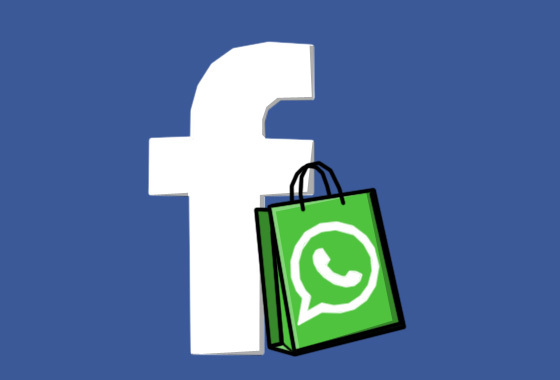 The intention is to provide with similar services on WhatsApp itself. Pretty soon the Airline and Banking Departments would be messaging you on WhatsApp. And don’t forget, you can use two WhatsApp accounts on one phone. This will allow you to keep professional and private communication easy to handle on a single device. The major drawback coming soon on WhatsApp would be its big policy change which is about to take place. It still doesn’t have a standalone PC version like Telegram, but it may soon this full feature soon. The Information shall be shared with the parent company, the Facebook. The user has the option to choose if he/she doesn’t want to share his whereabouts but information’s like device used, phone number, etc. shall get posted on Facebook. Danger to complete privacy. The Facebook Messenger exhibits the entire Facebook friend on the contact list. The App has its own video and voice- calling feature. You can sync the mobile number with the App which will give access to normal messages as well. A feature called “Message Requests” is available within the App where any messages sent by any person, not one among your friends list are saved. You can either accept or decline the requests. Supports the concept of GIF. Also, it has a wide variety of stickers and an option to scribble on the photos. The Messenger is looking for better features to include them within the App. Facebook Messenger has a ‘Secret Conversation mode’ which automatically deletes messages later on and it does not support the feature of end-to-end encryption. Snapchat has grabbed everyone’s attention and interest. Face filters, which weren’t termed to be original; drawing on photos, messages and stories is what Snapchat’s all about. It has come a long way as this app earlier was famous mostly for sexting among teens. Photos and videos can be shared with the followers that disappear within 10 seconds and messages within 24 hours. Videos can be edited the way you want by adding emojis, texts, smileys, and annotations. A Snapchat user can also follow the other users and can see their stories. Discover tab is an option which has contents related to image and video based articles. Making video calls and sending photos are among the common features while messaging on Snapchat. The design is complicated which makes it difficult for the Snapchat users in the initial stage to actually figure out its features. Making the new user all confused. End-to-end encryption is not provided and hence all the messages gets stored on the Company’s server for a minimum of 30 days before it gets deleted. Going through the pros and cons of the most widely used instant messaging apps it can rightly be said that Allo is here to give a tough competition to all.